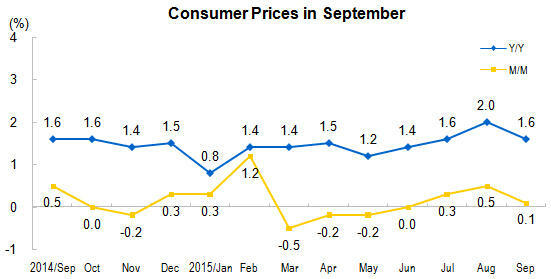 In September, the consumer price index (CPI) went up by 1.6 percent year-on-year. The prices grew by 1.6 percent in cities and 1.5 percent in rural areas. The food prices went up by 2.7 percent, and the non-food prices increased 1.0 percent. The prices of consumer goods went up by 1.4 percent and the prices of services grew by 2.1 percent. On average from January to September, the overall consumer prices were up by 1.4 percent over the same period of the previous year. 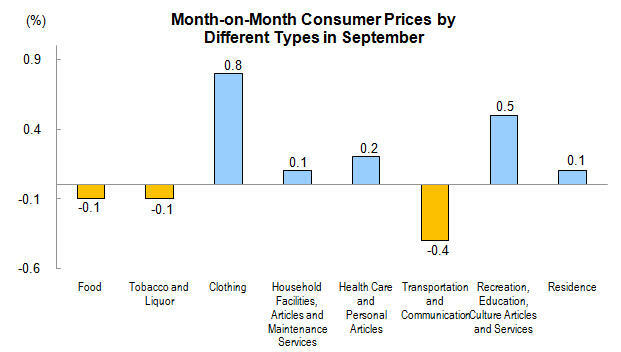 In September, the consumer prices went up by 0.1 percent month-on-month. Of which, prices increased 0.1 percent in both cities and rural areas. The food prices went down by 0.1 percent, and the non-food prices went up by 0.2 percent. The prices of consumer goods remained at the same level, and the prices of services increased 0.3 percent. In September, food prices went up by 2.7 percent year-on-year, affecting nearly 0.92 percentage points increase in the overall price level. 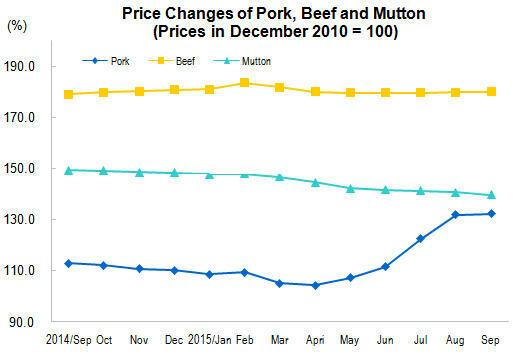 Of which, the prices of fresh vegetables, up by 10.4 percent, affecting nearly 0.31 percentage points increase in the overall price level; meat, poultry and related products, up by 8.2 percent, affecting nearly 0.62 percentage points increase in the overall price level (price of pork was up by 17.4 percent, affecting nearly 0.53 percentage points increase in the overall price level); aquatic products, up by 1.9 percent, affecting nearly 0.05 percentage points increase in the overall price level; grain, up by 1.4 percent, affecting nearly 0.04 percentage points increase in the overall price level; fresh fruits, down by 10.7 percent, affecting nearly 0.25 percentage points decrease in the overall price level; eggs, down by 10.2 percent, affecting nearly 0.10 percentage point decrease in the overall price level. In September, non-food prices went up by 1.0 percent year-on-year. 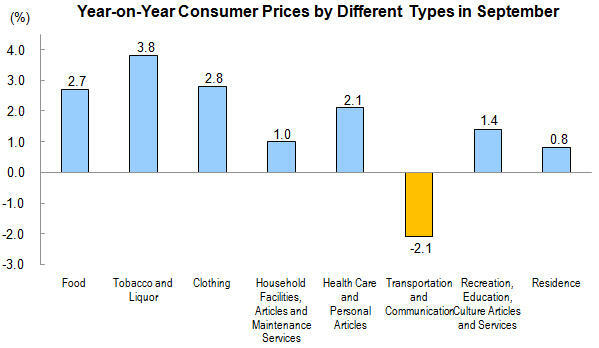 Of which, the prices of tobacco and liquor, clothing, health care and personal articles, recreation, education, culture articles and services, household facilities, articles and maintenance services, residence, increased 3.8, 2.8, 2.1, 1.4, 1.0 and 0.8 percent respectively, that of transportation and communication decreased 2.1 percent. According to estimation, in the 1.6 percent growth in September, the carryover effect of last year’s prices rising accounted for 0.2 percentage points, while new prices rising factors in this year accounted for 1.4 percentage points. In September, food prices went down by 0.1 percent month-on-month, affecting nearly 0.03 percentage points decrease in the overall price level. 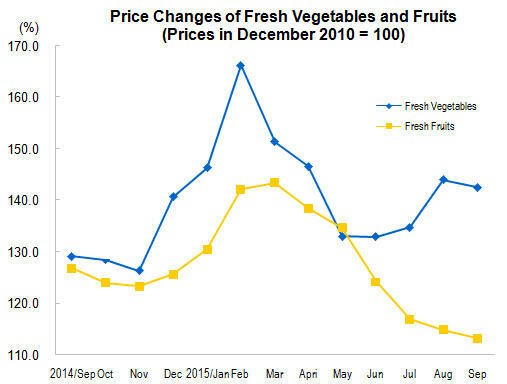 Of which, prices for fresh fruits went down by 1.5 percent, affecting nearly 0.03 percentage points decrease in the overall price level; aquatic products, down by 1.2 percent, affecting nearly 0.03 percentage points decrease in the overall price level; fresh vegetables, down by 1.0 percent, affecting nearly 0.03 percentage points decrease in the overall price level; eggs, increased 2.9 percent, affecting nearly 0.03 percentage points increase in the overall price level; meat, poultry and related products increased 0.4 percent, affecting nearly 0.03 percentage points increase in the overall price level (price of pork was up by 0.4 percent, affecting nearly 0.01 percentage points increase in the overall price level). In September, non-food prices went up by 0.2 percent year-on-year. Of which, the prices of clothing, recreation, education, culture articles and services, health care and personal articles, household facilities, articles and maintenance services, residence, increased 0.8, 0.5, 0.2, 0.1 and 0.1 percent respectively, that of transportation and communication, tobacco and liquor, decreased 0.4 and 0.1 percent respectively.